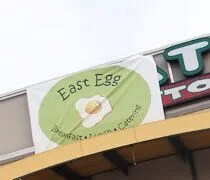 After posting my picks in the Gazette’s Readers’ Choice Poll, I had people trying to convince me that my pick of East Egg as my favorite breakfast place was wrong. I have to say, I’ve never had a bad meal at an East Egg and the service is always fantastic. That’s why, when J and I got up Sunday morning, I thought it was time we try out the new East Egg in Kalamazoo. The newest addition to this ever growing local chain is in the Campus Pointe Mall on the corner of Michigan and Howard near Western Michigan University. It’s on the Michigan Avenue side of the shopping center in the space that used to be Fat Burrito. The “front” of the building doesn’t actually face the street. It faces the parking lot. We pulled into the large shared lot and found a lot of cars there on a Sunday morning. I’m sure some of them were left there after a night of drinking at Capone’s. Since they went in to a strip mall this time, the space isn’t quite as open and vaulted as the other locations in this chain. It’s much smaller and has booths running along one wall that I’m sure were left over from the Mexican joint that occupied this place. We found the host who pointed us to a booth near the entrance. While the space is a little different from the others, they do try to carry some of the decor themes into the tight space. All the chairs have tennis balls on the legs and the color palate is bright and cheerful. The host took our drink orders as we sat down. I got a Coke while J got an OJ. The menu is pretty similar to the other East Egg’s and they, of course, have the the signature Eggs Benedicts. Our waitress came over right away with our drinks and asked if we were ready to order. I stuck with what I really like about the East Egg. The Eggs Benedict. I got the Classic Ham Benedict which is exactly what you expect it to be. Two English muffins topped with ham, poached eggs, and a house made hollandaise sauce. The eggs were absolutely delicious, but the funny thing is, I went straight for the potatoes. I’m usually pretty lukewarm on breakfast potatoes. A lot of times, I pick the crunchy parts off the tops and that’s all I eat, but these were by far, the best potatoes I’ve ever had at a breakfast joint. They were sliced thin as opposed to grated and they were very crunchy. There was just enough grease on them to make them the perfect breakfast potato. They call them “house potatoes” so I don’t know if they always do them like this, but I really, really hope they do….and I really hope they make these standard at all of the East Eggs. I really couldn’t believe just how much I liked the potatoes. J ordered a 3 Egg Omelet with just cheese. It came with the same potatoes I got and wheat toast. J was just as surprised by the potatoes as I was and hasn’t been able to stop talking about them. 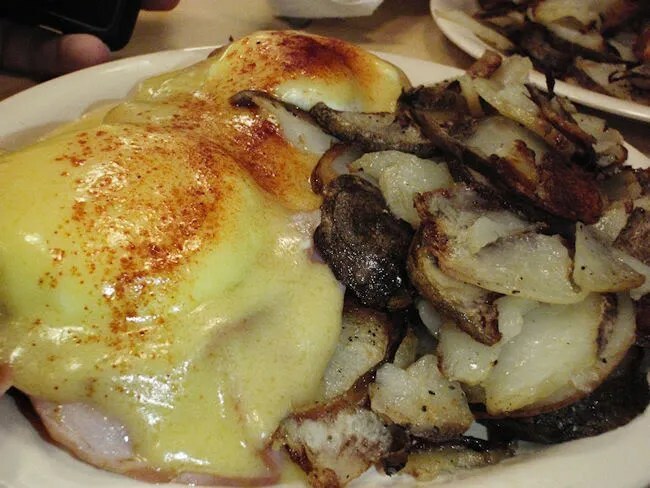 The potatoes alone could make this East Egg our go-to breakfast place. She cleaned her plate of the spuds before digging in to the eggs which meant she only ate about half of it. 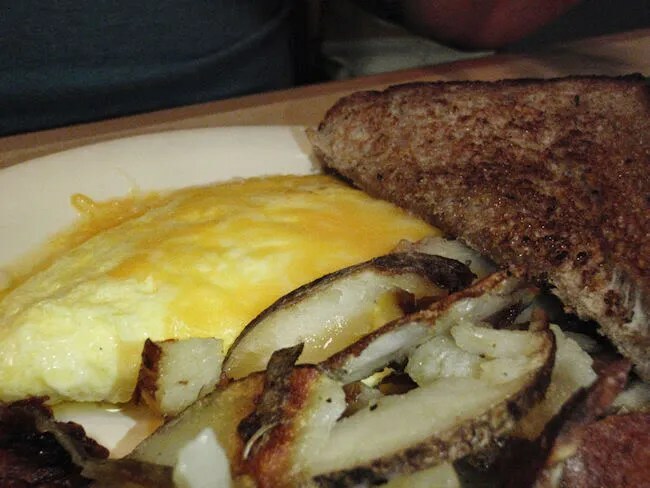 She said the omelet was good, but nowhere near as good as the potatoes. Our bill was just a little over $15 and we weren’t in that booth more than 20 minutes…and that’s a good thing. Whenever anyone tries to persuade me about another breakfast place, I always bring up the service. While the food may be good at the place most people prefer, we had a bad service experience. That’s never happened at an East Egg. We’re usually in and out in less than 20 minutes and even if there is a wait, they are usually minimal. They just get it at EDR Restaurant Group. They turn tables quickly which is great for everyone. Waitresses don’t slack off and ignore customers and the food is quick and delicious. 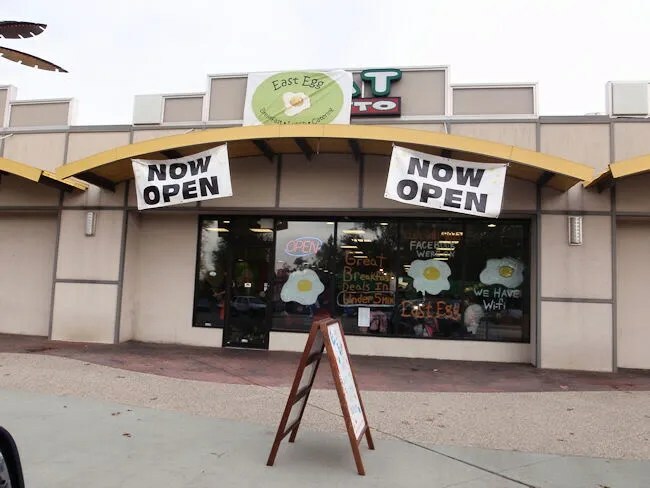 I’m very excited that an East Egg has opened on this side of town. They have some competition across the street, but I think they will be able to hold their own and this area of town will benefit from having a couple great breakfast places. man you are a monster! are you writing every day? Pretty much…actually not as much as I used to. So now the question is…Hung over on a saturday,which to choose Tiffinys or East egg?